Now that the end of the school year is coming, it will be time for the Conversation Assistants to say goodbye to their schools and their host families. Without all these generous volunteer host families that open their homes and their lives to the Conversation Assistants, this Program would not be possible, so we want to thank all of them. It is never easy at first to live with a stranger in one’s house. But the willingness to integrate the Conversation Assistant into the family has made it easy for most of the host families and Assistants. Host families are eager to learn about a new culture and improve their English, while trying to be the best possible hosts and make the Conversation Assistant feel at home and get used to our culture and way of life. You can read the small Guide for Host Families that we have written to get an idea of what hosting a Conversation Assistant implies. 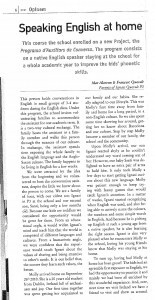 Here’s a text written by a host family of Escola Infant Jesús, in Barcelona, extracted from the school’s magazine Clar i Net. 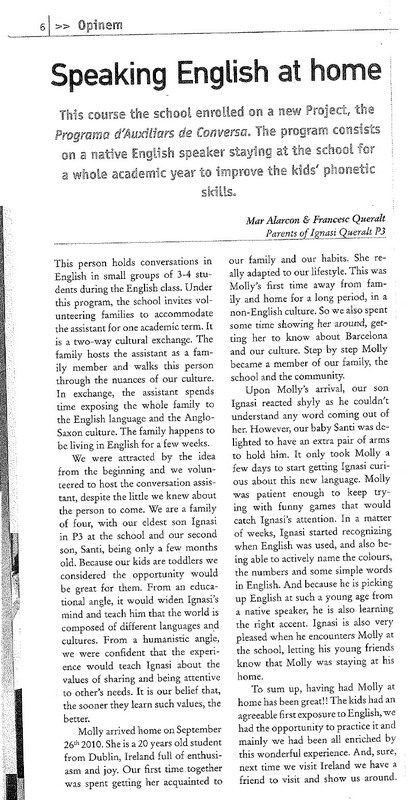 With a 3-year-old child and a toddler, they decided to become a host family for Molly, the Irish Conversation Assistant in their children’s school. After reading the text, it is clear that they are sure it was a great decision to make! Click on the image to read the text!